At North Shore Vacuum and Appliance, we have been selling top-brand central vacuum cleaners Salem MA area residents and businesses since 1934. We have decades of experience and dozens of brands to choose from. 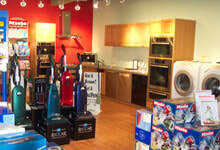 That's why when it comes to central vacuum cleaners, Salem area customers choose us. Overwhelmed by the number of options for central vacuum cleaners? Our experts are here to help. Run by a fourth-generation owner, North Shore Vacuum and Appliance has built a reputation for knowledge and expertise. Our shop is open six days a week; Monday-Friday from 9 a.m. to 6 p.m., and until 8 p.m. on Tuesday, and from 9 a.m. to 4 p.m. on Saturday. We offer free estimates on installations, and free advice on everything else. To schedule an appointment or speak to somebody over the phone about central vacuum cleaners, Salem MA area residents can call (781) 595-1455.